Whatever your viewpoint on dead animals as art, there’s no denying Philip Soucy’s skill when he gets to work on a cougar or a leopard, work that’s won him numerous top awards. How did you get into this, Philip? When I was a kid, growing up in Spokane, Washington, I lived three blocks from a taxidermist shop. My dad was a hunter and fished and as I was infatuated with the whole taxidermy process, I would hang out down there and sweep the floors. After graduating, I applied to be a taxidermist’s apprentice in Texas and got the job. What was the first animal you worked on? The first one I mounted was a white-tailed deer – that was 34 years ago. I was so into the process that when I left for the night after finishing it, I left the workshop and came back three times to look at it because I was certain that I had created the greatest work of art ever. I look at photos of it now and it was really rough. Can you talk us through what you actually do? Well there’s more than one way to skin a cat, and we do specialise in cats by the way, but we have a very specific procedure that we like to use. First, all of the meat and fat is removed from the skin, the ears are pinned and the skin is salted and then tanned. That transforms the skin into leather, with the hair on it. Once the skin is tanned you prepare it for mounting, which means cleaning up things like the eyelids, removing ear cartilage and basically thinning everything down. It is then glued onto a mannequin, usually made from polyurethane foam, which is poured into a fibreglass mould and gives a solid form that’s fairly light. The eyes are set, the ears then have a fibreglass resin or plastic ear liner glued in and then everywhere you made an incision and any other damage like bullet holes has to be sewed up with very delicate stitching. It sounds pretty stomach-churning – is it? Well, I guess you would say the grossest part is dealing with carnivores that have a belly full of meat and have not been skinned immediately, like coyotes and wolves that have laid in the back of a pick-up. After just a few hours that skin can start to literally turn green. They also give off a noxious gas and that’s a foul smell. Some of the guys use a respirator if it gets really bad, but I just try not to breathe through my nose. It’s definitely not a job for everyone. What’s the most complex part? Preparing the mannequin. That’s the most time-consuming and it varies a lot because every skin is a different size and so many customers want different poses. Preparing the mount for a cougar, for instance, would take two to three days on average, just to get the mannequin ready. Ever had an animal that seemed to give you the evil eye from start to finish? Not so much in the sense that there was any life in it, but obviously there are projects that just go smoothly and with very little effort the animal seems to come to life. And then there are those that, for whatever reasons, you can spend twice the amount of time on and they just will not mount looking as lifelike. What are some of the more unusual animals you’ve been asked to work on? Some of the more exotic ones are animals that you can’t hunt, such as the snow leopard I did. It belonged to a man who would use it for photography workshops – he would have people come in from all over the world. He would put this cat in a helicopter along with aspiring photographers and they would fly above his house up into the mountains. The cat was fairly tame and they would turn it loose and take photos in somewhat wild conditions. It lived to be 17 until it was eventually put down and we mounted it for the World Taxidermy Championships – and won a world title with it. Do you often come across bad taxidermy? I’m a judge at some of the European Championships and there’s sometimes some pretty scary stuff there. 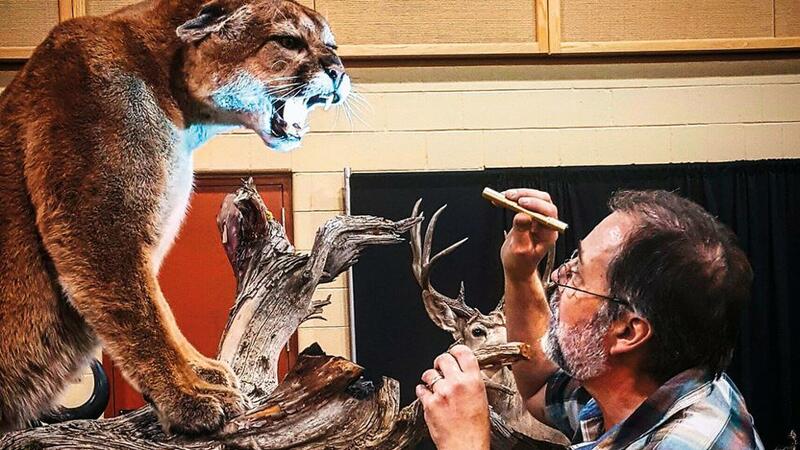 One thing we do quite a bit is redo the work of other taxidermists – probably two or three a year. And occasionally we redo some of our own as well because we know we can do better. How long does one of your creations last? There’s Victorian taxidermy that has been around since the late 1800s – primarily birds that were put in glass cases. But taxidermy is a pretty mortal piece of art. UV rays tend to bleach hair and feathers, and fluctuations in humidity and temperature can affect the skin. If it’s cared for well, 20 years wouldn’t be unusual, but generally a deer head, for example, looks a little dated after 10 years if it’s not kept well.